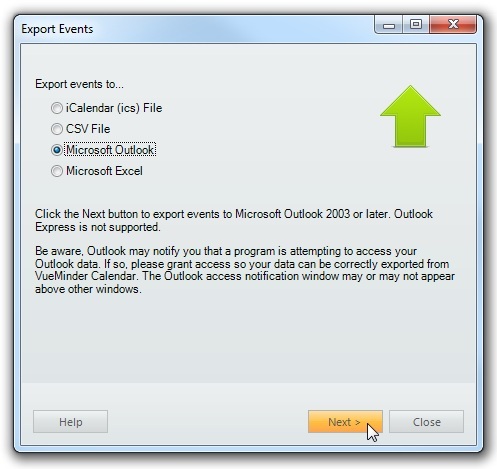 VueMinder can export a selected calendar, or all calendars, to Microsoft Outlook 2010 or later. If a calendar of the same name already exists in Outlook, the exported events will be added or updated in that calendar. If the calendar does not exist, it will be created. Note that if you want to keep your calendars synchronized between Outlook and VueMinder, a better alternative to exporting would be to enable Outlook Synchronization in the Calendar Properties window. Events belonging to the selected calendar will be exported. If you'd like to export events belonging to all calendars, select the "All calendars" option from the list. If you'd like to export all visible calendars (i.e., those with checkmarks in the Calendar List), select the "Visible calendars" option. You can also choose to exclude events older than a specified number of days from being exported. 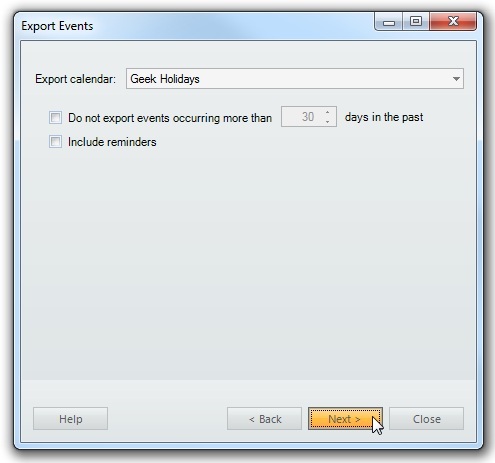 This may reduce the time required to export, especially if your calendar contains many events in the past. To exclude older events from the export, check the box labeled "Do not export events occurring more than...". Next, enter the number of days in the past that should be used as the cut-off. Any event occurring before that date will not be exported. Recurring events that begin before the cut-off, but continue after the cut-off, are not affected. To include reminders in the export, check the "Include reminders" box. Any events that have popup reminders or desktop alerts enabled in VueMinder will have a reminder enabled in Outlook. After you've selected a calendar to export and specified the desired settings, click the Export button. If you have many events, this could take several seconds. On some computers, Outlook might claim a program is attempting to access your email. Don't freak out. VueMinder is doing no such thing. However, access will need to be granted in order for the export to completed. After the export is finished, your calendar and events will be visible from within Outlook. A summary of the exported events will also be shown. 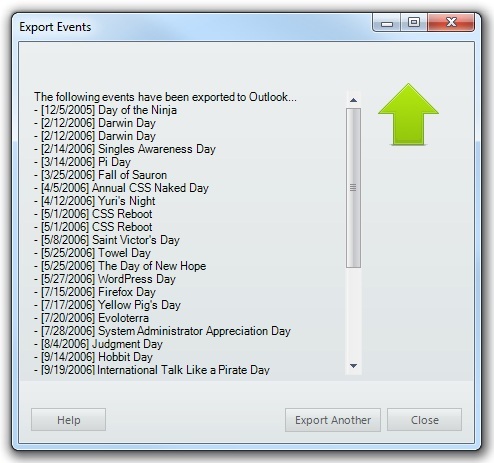 The "Export Another" button can be clicked to export another calendar, or the Close button clicked to close the window.